In 2008, Tribute to Liberty, a Canadian non-profit organization was founded with the goal of commemorating the victims of communism, as well as Canada’s participation in helping them. Designed by ABSTRAKT Studio Architecture, the monument will be located near both Canada’s Parliament Hill and the Supreme Court. A target of divided opinion, the National Memorial to Victims of Communism has become a subject of both acclamation and criticism. From a practical standpoint, the National Capital Commission (NCC) advisory committee displayed concerns regarding the placement of the memorial. The plot of land across from the Supreme Court had been set aside for parliamentary and judicial precincts, having enough room to construct an additional building if need be. Many have weighed in with political and ideological standpoints. Supporters suggest that the monument will offer recognition to Canadian immigrant populations who have suffered at the hands of communist regimes, which continue to participate in historical disavowal. Some detractors, however, insist that the monument is too imprecise—claiming to represent victims across borders and time. Others argue that it is a flagrant artifice of conservative partisanship. The problem of having such a subjective monument straight across from the Supreme Court—an institution aspiring towards neutrality and objectivity—has also arisen. Chris Selley documents a list of complaints made against the memorial. In reaction to critics arguing that the monument has no central place in Canada’s history, he declares that diasporas from communist regimes do, in fact, constitute an important part in the nation’s historical narrative and social fabric. Writing for The Globe and Mail, Bob Ramsay casts aspersions on the project’s funding techniques, where donors can get their name inscribed on the monument for 100,000$. Though the NCC’s policies once prohibited the acknowledgement of donors on monuments, this rule was rescinded three years ago. Two years ago, the NCC’s jurisdiction over the memorial was taken away and put under the auspices of the Federal Department of Heritage. The department claims that the abovementioned policy changes were unrelated to Tribute to Liberty. Amidst the outpouring of editorial pieces on the controversial monument, Conrad Black made a curious remark: Most monuments face public backlash before their erection. Whether memorial projects frequently provoke comparable levels of ire within liberal democracies is debatable. 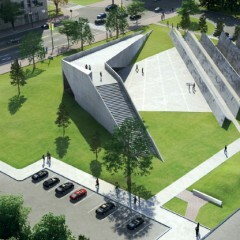 “Canadian Memorial to Victims of Communism Unveiled” (editorial). UpNorth, December 11, 2014. Accessed November 25, 2014. http://upnorth.eu/design-canadian-memorial-victims-communism-unveiled/. “Ottawa’s Monuments Men Panned” (readers’ letters). TheStar.com, December 27, 2014. Accessed January 15, 2015. http://www.thestar.com/opinion/letters_to_the_editors/2014/12/27/ottawas_monuments_men_panned.html. “Letters: Ottawa Memorial to Victims of Communism.” Ottawa Citizen, December 15, 2014. Accessed January 15, 2015. http://ottawacitizen.com/opinion/letters/letters-ottawa-memorial-to-victims-of-communism. Kelly Egan. “Monumental Mistake? Victims of Communism Memorial Seems Too Vague to be Poignant.” Ottawa Citizen, December 16, 2014. Accessed January 15, 2015. http://ottawacitizen.com/opinion/columnists/egan-monumental-mistake-victims-of-communism-memorial-seems-too-vague-to-be-poignant. Black, Conrad. 'Conrad Black: Almost All Monuments Are Opposed Before They Are Unveiled. Let’s Build Them'. National Post, April 18, 2015. Accessed April 20, 2015. http://news.nationalpost.com/full-comment/conrad-black-almost-all-monuments-are-opposed-before-they-are-unveiled-lets-build-them. David Frum. “Critics of Canada’s Monument to the Victims of Communism are Wrong. Here’s Why.” National Post, December 20, 2014. Accessed January 15, 2015. http://news.nationalpost.com/2014/12/20/david-frum-critics-of-canadas-monument-to-the-victims-of-communism-are-wrong-heres-why/. Don Butler. “Documents show NCC Concerns about Victims of Communism Memorial.” Ottawa Citizen, April 22, 2015. Accessed April 2, 2015. http://ottawacitizen.com/news/local-news/documents-show-ncc-concerns-about-victims-of-communism-memorial. Ramsay, Bob. 'Where Else Can You Buy Your Way Onto A War Memorial?' The Globe and Mail. April 6, 2015. Accessed April 25, 2015. http://www.theglobeandmail.com/globe-debate/where-else-can-you-buy-your-way-onto-a-war-memorial/article23808495/. Selley, Chris. 'Chris Selley: Tallying Up The Formidable, Over-The-Top Objections To The Memorial To Victims Of Communism'. National Post. April 9, 2015. Accessed April 25, 2015. http://news.nationalpost.com/full-comment/chris-selley-tallying-up-the-formidable-over-the-top-objections-to-the-memorial-to-victims-of-communism.